This home built contraption comes from Redditor “otherwiseguy”, who PVC pipes and couplers to raise a common folding table to standing height over his treadmill. Not the prettiest setup to look at, but at about $40 in parts plus the table, it’s probably the best bang for your budget! Skateboarding on a treadmill desk? Not to ever be outdone, the guys at Wired.com decided to review a LifeSpan TR1200-DT7 treadmill desk in true geek fashion by doing all sorts of activities that are probably not recommended by the manufacturer. Namely, rolling their chairs on the treadmill, having two people walk at the same time and even giving skateboarding a shot. Sarah and Ben Hilmer decided too that splurging $2000 for a fancy desk wasn’t going to suit them, given that they were newly weds and Ben was rather handy. As related on Huffington Post, the couple used some everyday materials and tools such as a hand saw, electric drill, particle board, paint and straight edge to go to work. 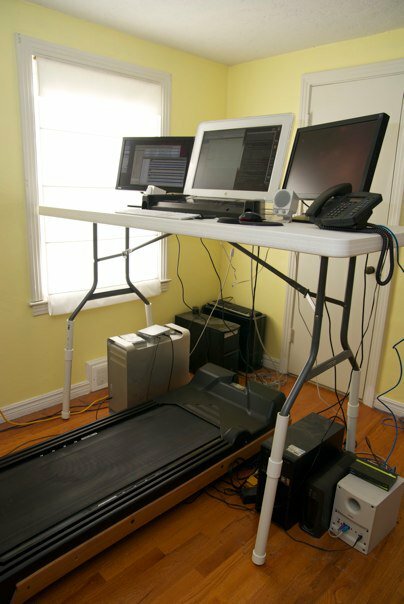 This quaint little treadmill desk was the result. This is almost reminiscent of an 80’s arcade cabinet and at first glance, the phone on the desk actually looks like a joystick. Robin Shreeves was suffering from lower back pain even after switching to an ergonomic chair and realized it was time for a standing desk. Also not one to shy away from some DIY jerry rigging, she simply flipped a laundry basket upside down on her desk and put her laptop on top! This contraption would almost be laughable if it weren’t for the fact Robin is feeling much better, has less pain in her back and hips and is feeling healthier overall. While she doesn’t have a treadmill attached, why let it stop her? Go Robin! ← Walk Across America…While Working at a Desk!